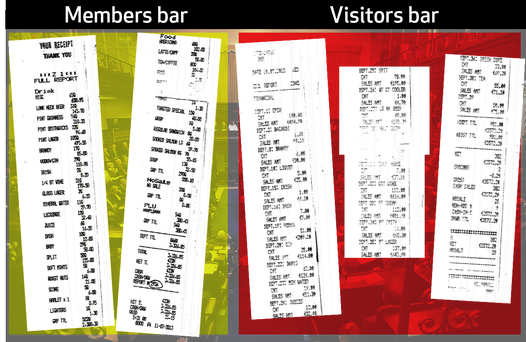 TDs and senators drank significantly more pints than normal in the Dail bar on the night the controversial Protection of Life During Pregnancy Bill was debated. The night in July was dubbed 'lapgate' after Fine Gael TD Tom Barry was captured on the Dail TV cameras pulling party colleague Aine Collins on to his lap at 2.40am. Within an hour, the incident – which Fine Gael sources later described as "horseplay" – had gone viral on the internet. An analysis of figures obtained by the Irish Independent shows that 179 pints of Guinness and lager were bought at the Dail members' bar on July 11, compared to 29 pints on June 26 and 46 pints on an July 18, also Wednesday nights. The figures come from the bar's till receipts and compare a number of Wednesday nights, including the abortion legislation vote. Wednesday is traditionally the biggest drinking night in Leinster House. A total of €1,440.80 was spent on 313 alcoholic drinks the night of 'lapgate'. Separate to the figures for alcohol, 176 coffees and teas as well as food were ordered at the bar, which closed at 5.31am on Thursday. On a random Wednesday night in June – on the 26th – a more modest €373.30 was spent on 78 alcoholic drinks. Cork TD and father-of-three Mr Barry admitted he had been drinking but insisted it wasn't to excess. "There was nothing pre-meditated, it was stupid," he said. Ms Collins accepted an apology from the Cork North East TD but insisted the incident was not typical of goings on in the Dail. She said afterwards: "About 90pc of the time that I am in the members' bar, I am having tea, or coffee or something to eat. It just doesn't serve only alcohol. "Maybe we could change the name to the members' lounge. A lot of work gets done in there. "I'm sure there were people drinking, but were they drinking or having a drink? The majority of people that I saw were drinking tea and coffee." On the same night inside the visitors' bar, where TDs and senators often drink with their guests, €3,572 was spent, compared to €2,157 on a random Wednesday night in June. The visitors' bar closed after 10 that night, July 11, according to Oireachtas records. Last March, similar figures obtained by the Sunday Independent showed politicians also bought significantly more alcohol than normal on February 6, the night the former Anglo Irish Bank was liquidated. Sinn Fein president Gerry Adams stated that there were at least two TDs in his vicinity who were intoxicated that night. The figures show that on nights where big pieces of legislation are being voted on, members tend to buy more drink. The amount spent on alcohol on the night of the abortion debate is eclipsed only by the night of the Budget last December. On Wednesday, December 5, while voting in tax increases on cigarettes and alcohol went on until 11pm, our public representatives spent €1,487 on 335 alcoholic drinks. While the Oireachtas does not keep figures for how many members attended the Dail on any given night, voting figures show that 143 TDs were present to vote on the abortion bill. The figures were similar for the other nights in our analysis. Some 126 TDs were present for a vote on the evening of Wednesday, July 17, while 119 were present to vote on a motion to do with special education on June 26. Fine Gael TD Simon Harris later told the 'Marian Finucane Show' on RTE radio that the issue of the Dail bar being open and serving alcohol until 5am needs to be addressed. Several TDs on all sides later said they drank on 'lapgate' night but denied TDs were intoxicated. However, others claimed that "one or two" deputies "were a bit wobbly". Ceann Comhairle Sean Barrett said that the Dail bar should remain open as long as the Dail was in session, saying it was a facility where members could go to have some privacy.